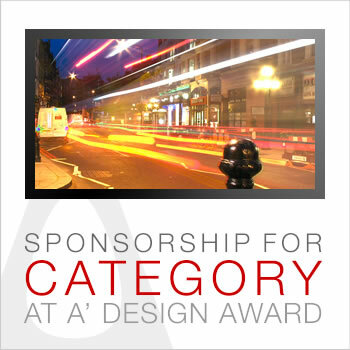 A' Design Award Category Sponsorship is possible in 4 ways. The first, is being a Metal (Gold) Sponsor to an A' Design Award Category, The Second is by offering a Prize to Category Winner or Winners which is counted as a Metal (Silver) Sponsorship. Thirdly, there is Jury Sponsorship counting as Metal (Bronze), and finally as being a media partner to the category (Silver-Bronze/Metal). Being The Main Sponsor is a prestigious title and brings forth many benefits such as your name being included in almost every communication. Most importantly, in this option the Award Prize will be named as "[Entity Name] - A' Design Award in [Category Name]". Plus your institution will get many direct benefits as explained here, in addition to the common benefits written here. There is only 1 Main Sponsor for each category. Category Prize Sponsors are sponsors for money, product, education, job-contract or other promotive prizes in each category, The sponsor can be a company, organization or individual. The prize has to be significant; a prize is considered significant if it is at least triple the minimum wage from country where the Sponsor is from. This is a one-time sponsorship but could be repeated. Your institution will get many direct benefits as explained here, in addition to the common benefits written here. Category Jury Sponsor is a sponsor company or organization who provides an important or famous Jury member to a given competition. Members of sponsoring organizations, employees of the sposoring companies, and the immediate family members of the sponsoring companies and organizations cannot enroll for a prize. For custom competitions only the Jury members cannot join the competition. Individuals can also apply for being a jury, but in case their immediate family members and themselves cannot enroll for a prize. This is a one-time sponsorship but could be repeated. Your institution will get many direct benefits as explained here, in addition to the common benefits written here. Category Media Partners are members of both the traditional (Silver/Metal) or digital media (Bronze/Metal), who support the A' Design Award and Competition by means of communication prior or post the event. Category Media Partners are press and press-related companies that helps to spread the news on A' Design Award and Competitions. A' Design Award and Competitions will accept maximum six sponsors from each country; this is divided into a newspaper, a magazine, a website, a television, a radio and a PR company. This is a one-time sponsorship but could be repeated. Your institution will get many direct benefits as explained here, in addition to the common benefits written here. For different type of Media Partnership options click here. Name Benefactors are individuals or entities who wish to offer a small prize on category based competitions with their names, the award will be called as "Name-Surname's A' Design Award in Category-Name". This does not effect all the winning designs in this category, but only one of the awards will be renamed so. This is a one-time sponsorship but could be repeated.